Hey, does this ever happen in your world? Got any passion projects you can’t seem to get off the ground? You know what you want to be doing with your time and energy, you’ve got the skills and know-how to get it done, you’re super excited about it, but somehow it’s still a struggle. Maybe you’ve got a solid studio practice, but you can’t quite seem to get the right foods into your shopping cart. Or you’ve got the fitness habit nailed down, but you can’t find your voice at work and you feel out of place. Or you know there’s a bigger, more exciting role for you to play in your community, but you just can’t muster the courage to put yourself out there. Why is it that your passion project (at home, at work, in your relationships) feels like wading through thigh-high mud sometimes? Some of this is just about making new habits, of course. Our brains and bodies like to take the same old path over and over. New paths can feel difficult to forge. And it’s always good to do an honest assessment and ask yourself if you have too much on your plate, or if you need to delegate some of your duties to other people. A more difficult question is asking if you are running from project to project to avoid your feelings, or avoid participating in certain relationships. Often, however, I find there’s a mismatch between our desires, our intentions, and our beliefs. When I hit this wall (and I’m there right now with y’all), I know there’s a deeper level of mud waiting to be explored. And that deeper level of mud is the squishy realm of the subconscious mind. then your passion project (or the life you desire) is going to sit on a shelf getting awfully dusty. And a dusty passion project, or worse, a dusty life, is a huge detriment to you, your loved ones, your community, and to the world at large. 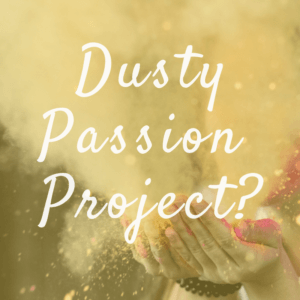 Yep, your dusty passion project, if left untended, is a huge energy leak, and can even make you sick. At the minimum, it will leave you feeling vaguely and persistently unfulfilled, and dare I say even a bit cranky. So what’s a passionate, driven, capable, heart-centered human like yourself supposed to do? 1. Rewire Your Brain with PSYCH-K.
Our thinking is the biggest obstacle to experiencing everything we want. Yes, you read that right. It’s not about needing mo’ money, mo’ time, or mo’ skills and opportunity. If you want mastery over your thoughts, then PSYCH-K can get you there in a jif. If you find yourself in negative or limiting thought patterns (broken record, hello!) and you want to break free, book a quick 30-minute conversation with me to see if PSYCH-K is right for you. Did I mention it’s a free call? 2. Learn to Embody Your Intentions. Wait, whaaatt? Just like we need to retrain our brains to think differently, we need to retrain our bodies to act differently. We need to break our chemical addiction to living in the past. And before you know it, you’re living the same day you lived yesterday, feeling the same things you felt yesterday, and your life, and your passion project is getting dustier and dustier. If you want to understand this on a visceral level, and experience embodying your intentions in real-time with me, then you’ll want to join me for Inner Sanctuary, my mini online retreat on March 31st. Early bird and donation tickets available. So how would you think and feel, and what would you do and say, if you were living out your intentions, and acting on your passions? If you were actually living the life you really want? Let me know what your passion project is! I love hearing from you.